Frequently in fiction, your typical city tends to take the view that when it comes to defense, Crazy-Prepared is good. Very good. In fantasy or medieval settings, such a city will always have high and thick walls, which usually (and impractically) enclose the entire city. The walls will constantly be patrolled by a sizable force of guards, who are very well armed, armored, and trained. These guards will also frequently have ready access to heavy artillery for defensive use, including catapults, ballistae, and/or even (if the setting allows it) cannons. More modern settings will feature naturally updated defenses, from electric fences to bomb shelters. Futuristic settings will have Force Fields, automated turrets, and even more strange and novel mechanisms. One which protects large areas of land around the city may surround them with The Great Wall. Of course, the practicality and costs of creating and maintaining these defenses will never be brought up, as well as the original reasons for creating said defenses. This usually means that these defenses vaguely imply a Crapsack World; after all, there would have to be some justification for those preparations in the first place, even if it's never explicitly stated. If these defenses are put to the test (and they usually will be), the results will vary, depending on the work. These can range from the city being destroyed to showcase how prepared/numerous/tough the armies of the villain(s) are, to pretty much holding up to whatever gets thrown at them with little effort. This is a subtrope of Crazy-Prepared. See also The Siege. If the defenses fall, the after effects may include Watching Troy Burn. Midland's capital city of Windham, a population center and seat of the nobility and monarchy, is surrounded by curtain wall and patrolled by royal troops, which our heroes find out makes it as difficult to escape as it is to get in uninvited. Unfortunately it isn't enough to repel a surprise invasion when the Kushan show up en masse and the kingdom's forces have been dispersed throughout the land because of the king's madness. The port city of Vritannis is a powerful city state that grew wealthy from international banking and trade, so that it becomes the natural staging area for the armies of the Holy Alliance. The Kushan invasion makes its great walls, moat, and adjacency to the sea seem like good investments, although they would have been screwed anyway without the arrival of The Cavalry. 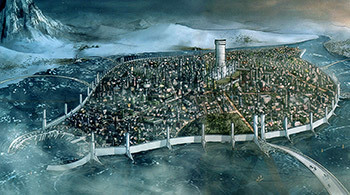 As of the end of the Millennium Falcon Arc, Griffith's new capital city of Falconia is a shining metropolis of white stone with soaring, gargantuan walls all around, multiple layers of fortification on the inside including gatehouses and drawbridges, and a kind of acropolis elevated above the rest of the city where the Falcon himself goes to roost. Tokyo-3 of Neon Genesis Evangelion, which has a number of defensive systems surrounding the city (namely missile systems), the Evangelions, structures that hold EVA-scale weapons and buildings that can retract underground for safety. Beneath the ground are multiple layers of armored plating and bunkers for citizens to hide in. In fact, the city was built to fend off the coming Angels. The SDF-1 Macross of Super Dimension Fortress Macross/season one of Robotech houses a city within itself, after accidentally taking it with them during a space fold. Forget cities, by the time of Macross Plus, Earth is a Citadel Planet with enough ordnance defending it that you probably walk around it in low orbit. On top of the walls surrounding the entire civilized world of Attack on Titan, there are more straightforward examples in the form of cities like Zhiganshina and Trost, placed just outside of the main structure of the walls with outcroppings surrounding them. The heavy guard and gun presence on the walls of those cities is actually a cost saving measure for the rest of the wall; manning the entire wall would spread defenses impractically thin, so the cities are set out as bait to draw the Titans to specific points where defensive elements can be concentrated. Gunka No Blazer: The inner section of Baselland's capital city is arranged like a star fort. The station cities of Kabaneri of the Iron Fortress are the only measure of safety for the remaining population of a steampunk Japan-expy. To hold back the tides of the undead Kabane, these cities have thick walls and cannon mounts as well as armies of bushi, while sending out armoured trains for trade and transportation. Sadly against their mighty foes, even these aren't enough. The city of Lyrias in Akagami no Shirayukihime is protected by thick defensive walls and a series of well guarded gates though some residential buildings have sprawled to the outside of the walls. In addition to hosting an impressive series of libraries in the academy district the city is also a northern checkpoint for goods and people entering the kingdom of Clarines. The Megacities of Judge Dredd have massive defenses against infiltration from the Cursed Earth, strategic and tactical air defense, and armed forces ranging from the Judges themselves to emergency Bloc militias. And entire megacities still get wiped out. Sogo from Barbarella is surrounded by an impassable Labyrinth. Fall of Liberty: Algonquin quickly becomes this as the plague spreads, with twenty meter high concrete walls being erected on the bridges and around the edges of the island, whilst LCPD and NOOSE units protect all of the bridges and the city interior from undead attack. It doesn't work. Shingeki No Lesbian Horses: Twieren and her fellow ponies (and Spiarmin) live in this after Twieren raises Wall Sina, though the city is a smaller part of it. The interior of Wall Sina is mostly composed of rural areas. On Coreline we have the city of Los Angeles, California, which in the aftermath of the disaster that created the titular setting has become an Expy of Judge Dredd's Mega-City One (only with a lot less cynicism). The Citadel from Mad Max: Fury Road, which is under the cruel dictatorship of Immortan Joe. Once Imperator Furiosa kills Immortan Joe at the end of the movie, Furiosa becomes the leader. Goblin City from Labyrinth is in the center of the titular Labyrinth. Land of the Dead: The center of Pittsburgh has been turned into a fortress in the wake of the Zombie Apocalypse, being surrounded by water on three sides (which zombies are averse to) and an electrified fence on the only overland side. The city is later overrun when the zombies learn to walk across the river. Minas Tirith from The Lord of the Rings is one of the key codifying examples: seven concentric tiers carved into a mountain, each with its own wall and gate. Unlike some, there's a clear justification for it; Sauron's forces are out there and the place was originally built as a military fortress, only becoming the capital city much later (after Osgiliath and Minas Ithil—now Minas Morgul—were overrun). Its current Old name was Minas Anor, "The Sun Tower" name means "The Watchtower"
The Silmarillion has Gondolin, which as well as being a Hidden Elf Village is practically a Citadel Country. It's surrounded by impassable mountains with the only way through being a hidden ravine and tunnel, barred by seven gatesnote The in-universe inspiration for Minas Tirith's own layout each with its own company of full-time guards. Passing those gets you into the valley; the city itself sits on a hill in the middle of that and has walls and defences of its own. The Forgotten Realms setting has most of the cities set up like this. Phlan is the most prominent example in the novels, falling under attack several times, but holding them off each time. On Gor, most city-states are built like this, with walls to keep out outsiders and gates to let people in. In Falkenberg's Legion, the capital city of Harmony-Garrison. Originally settled by Christian farmers, the planet Arrarat was supposed to be a peaceful venture, so the city was not walled in. Then the Bureau of Corrections got involved, and began dumping convicts on the planet. To protect its interests, the CoDominium sent a Marines who fortified the city of Harmony, and made a fortress of Garrison attached to it. In King David's Spaceship, the city of Batav is a typical example of this, due to being on a low tech world. This is not without reason; due to local climate changes, barbarians migrated and besieged the city. In the Legacy of the Aldenata, major U.S. cities located in territory that was deemed indefensible against the Posleen invasion were turned into fortresses that would be able to hold out on their own while surrounded by Posleen armies. New York City was one example. The Wheel of Time has many fortified cities. Most notable is Tar Valon, which is triply defended by being built on an island in the middle of a large river, surrounded by Power-wrought walls, and home to the White Tower of the Aes Sedai Witch Species and their Super Soldier Mindlink Mates. It's well known to have never been successfully besieged — though this is an Internal Retcon quite insistently maintained by the Aes Sedai, who prefer that people not know that an army once made it as far as the Tower grounds. However, by the time a siege actually becomes relevant in the latter few books, the advent of traveling has become so widespread that its walls are useless. The Citadel of the Algars is the only permanent structure in the Algarian grasslands - the Algars are otherwise nomadic. It's practically a man-made mountain which the Algars have been constructing nonstop for centuries - they have annual drag-boulders-to-the-Citadel competitions. Its sole purpose is to be a huge target for any invading army - there's basically nothing inside except for a huge labyrinth that anyone breaching the gate can get lost in while Algarian bowmen take potshots at them from atop the walls. The City of Riva is located on a desolate, rocky island in the middle of the western sea. It covers the ONLY sizable cove where an army could land, with a huge wall. Inside, the city is build in tiers, and every house is part of he fortification - all the walls that are turned 'outwards' are built extra-sturdy and windowless, so in case of a wall-breach, every tier can become a new wall as the defenders gradually fall back to the Rivan Castle itself - which, of course, has some pretty imposing walls and defenses. The entire reason the city was built, on a previously-uninhabited island, was to protect the the Orb of Aldur. No army has ever so much as breached the outer walls... but the defenses have, on many occasions, proved less than formidable against trickery and infiltration. Armengar from the first Riftwar Saga, which is a highly fortified city occupied by human settlers north of the kingdom, frequently attacked by goblins and moredhel (dark elves). The design is similar to that of Riva, with each building capable of acting as a fortified outpost on its own. As a last resort, the city is equipped with a Self-Destruct Mechanism to blow the entire place (invading army included), providing a distraction while the inhabitants escape through tunnels. The X-Wing Series establishes that Coruscant, the galaxy's capital in Star Wars, is quite thoroughly defended, with a powerful defense fleet and a double-layered planetary deflector shield grid. A major part of Wedge's Gamble is the Rogues' effort to disable the shields long enough for the New Republic to invade. The Sword of Shannara had Tyrsis, the capital of Callahorn. The city had a heavy wall and thick gate plus was built into a mountain. On top of that you had the Border Legion of Callahorn guarding the city. Ultimately, the defenses are not breached through strength but by treachery. Spies within Tyrsis jam the locking mechanism to the city gates, allowing easy breaching by the vast army of the Warlock Lord. Only Shea destroying the Warlock Lord stopped the obliteration of the Border Legion and the conquest of Tyrsis. E. R. Eddison's classic The Worm Ouroboros has Carce, the heavily fortified capital of Witchland, wich is described both as a citadel and a city. The Last Redoubt in The Night Land and Awake in the Night Land, which is a massive pyramid protecting humanity from unspeakable horrors that roam the darkened Earth. To ensure their safety, the Last Redoubt is surrounded by the "Air-Clog," an electric circle that creates an invisible barrier prohibiting any monsters from entering the Redoubt. This may be the first fully realized version of a force field in all of literature. Ankh-Morpork of the Discworld was once a walled city, but much like such cities in real life it eventually overran its borders, and the walls were picked apart over the years by citizens in need of building materials. The remains of this earlier wall are to be found at intervals inside the City, rendered redundant when it began to overspill from its original boundaries and thus necessitating a second wall to be built. The second set of walls and towers are more or less intact, although the castle and keep on the Tump which would have been the strategic lynchpin of the system have long since fallen into ruin. "Today" the city is again demonstrating why walls become redundant, as its seemingly unstoppable growth has created suburbs which stretch a long way outside the walls. There appear to be no plans to build an even longer and far more expensive third wall. Lord Vetinari abhors un-necessary effort and expense. On top of that, Ankh-Morpork actually has a unique way to deal with invaders, one that does not need walls: If a barbarian horde were to besiege the city, the citizens would welcome them with open arms, and before the barbarians would realize, they had become part of the city life. Doctrine of Labyrinths: Damaging Mélusine's massive, 700-year-old walls qualifies as treason, which is odd, since they don't seem to serve much purpose beyond looking cool. Assaults are much likelier to come through magic than a physical invasion. Xenos: any city to some extent, depending on the paranoia level of the rulers. Belgor, founded to house the Hunters and stand against the Blight. The harbor of Baros, justified as the single available landing point on the entire island. The island itself is described as a natural fortress, and the Properly Paranoid ruler Kriy has done everything to fortify that single weak point. The city of Vervunhive in Necropolis is a formidable example. The "curtain wall" surrounding it is nearly a hundred meters tall and boasts colossal siege cannon as well as anti-air missiles, gun emplacements, and large garrisons. There are only a handful of gated entry points, each with its own highly reinforced guard houses. Topping it all off (literally) is a huge shield generator that can protect the entire interior space from artillery fire virtually indefinitely. Unfortunately, the city's substantial suburbs (as much as half of its population either lives or works outside the walls) are not protected at all aside from a handful of bunkers, its design serves to prevent the defenders from launching counter-attacks with any real effectiveness, and cooping a few tens of millions of humans up together leads to panic and near rioting. In the end, the final Chaos assault destroys almost all of the fortifications before being repelled by, ironically, a counter-attack that the defenders never would have countenanced were their walls still standing. Their rival, Ferrozoica Hive, is implied to be equally impressively defended (both sets of defensive works date to a "Trade War" the two hives fought around a century before) — which is why, when they arrive, the Imperial fleet just lances it from orbit. In Wrong Time for Dragons, three of the four Elemental Clan capitals are protected by walls. The Air Clan's fortress is located atop a mountain peak called the Fang of the Four Winds and is surrounded by stone walls, the only city in this world with them. The other two walled cities (the Water Clan's capital of Hundred Fields and the Earth Clan's capital of Feros) use wood. Averted with the Fire Clan's capital of Oros, which is located underground and has no defensive fortification. Why? Because any attacked would first have to go through the Fire Clan's battle mages, which are the best of all the Elemental Clans, especially on their home turf (the air is so hot and dry that it robs the Air and Water Clan mages of much of their power). To a lesser degree, the "capital" of the Cat Clan is a castle in the woods surrounded by a living wall of thick trees. Fittingly for a planet named after the god of war, Martian cities in the Barsoom novels are all fortresses; the relationship between most Red Martian nations at the best of times can fairly be described as "armistice", and the Green Martians would love nothing better than to sack any of them. In E. William Brown's Daniel Black series, a protagonist from our world is transported to a magic-based world which is undergoing the "Fimbulwinter" of Norse mythology - basically, it's going to be winter for thirty years. To help ensure the survival of humanity, he creates an Arcology with hundred-foot-thick solid granite walls (Not a hundred feet high, a hundred feet thick.) and which has its own internal power sources and agricultural systems. In Doctor Who, Gallifrey's two greatest cities: Capitol (sometimes called Citadel) and Arcadia were protected by hundreds of sky trenches. Prior to the end of the Last Great Time War, nothing has been able to breach even two sky trenches. Then a large Dalek force manages to break through all 400 sky trenches over Arcadia and ravages the city. On the other hand, despite having fewer sky trenches, the Capitol's defenses are never breached. In Magic: The Gathering, specifically the Shadowmoor block, the insanely paranoid Kithkin build all of their settlements this way. It's a common feature of Abzan settlements on Tarkir, too. In the present, the walls are the main defences; in the distant past of Fate Reforged, they mount ballistae on top to deal with marauding dragons; and in the alternate present created by Sarkhan's meddling, they've been taken over by the Dromoka dragon brood and the ballista platforms have been turned into landing pads. Warhammer 40,000 has several Citadel Planets ("Fortress Worlds"): One of them is Cadia , which is located near the only stable passage to the Eye of Terror from which the Legions of Hell regularly emerge. Nearly three quarters of the population serve in the military, Child Soldiers are taught to use a gun before they learn to read, and is protected by its own fleet of spaceships. This being 40K, it still wasn't enough to prevent the invading forces of Chaos from currently having a stranglehold on it. Each Space Marine chapter has a "fortress monastery" as its HQ. Each is basically a self-sufficient city complete with living quarters, workshops, temples, spaceport etc. Hell, every Imperial space ship in the universe basically fits this description, with a crew size of at the lowest end 20,000 men, they have the population of a small to large city, defenses capable of dealing with both the threats of warp travel and capable of defending against the ridiculous firepower of anything in the same category with it for atleast a short amount of time. Special mention should also go to the Eldar Craftworld Ulthwe, which is a massive world ship with a population in the billions trapped orbiting the Eye of Terror. (the same warp storm which is so dangerous it requires a planet like Cadia to act as a Beef Gate for the rest of real space. CthulhuTech: Most major cities have been converted into hardened, self-contained Mega City structures, and living outside one is a very bad idea. In Rocket Age the Martian city of Kolpith was an unassailable city for many centuries. It fell the moment the French brought modern military technology to bare on its walls however. In Iron Kingdoms Caspia the capital of Cygnar has so many walls its called the "City of Walls"
Apophis Consortium's Obsidian: Age of Judgement, has The Zone. The Zone is a massive fortified cityscape 1,280 stories high and 22 miles long and the last major habitat for humanity in North America after a massive demonic invasion. The Zone isn't just big, almost every metre of it is studded in artillery cannons that fire thermobaric shells and the Zone can unleash hordes of battle vehicles and bionic soldiers to counter-attack anything Hell can throw, including mountain-sized demons. Ta-Koro from BIONICLE is basically a walled city inside a volcano with a sea of lava protecting it. Though less impressive, Po-Koro is also heavily defended, being built inside a massive hollowed out mesa with only one entrance. All the remaining cities in Aegis of Earth: Protonovus Assault are basically these, as they'd be torn apart by the Protonovus otherwise. Part of the challenge is putting together an effective Citadel City that can weather the various types of Protonovus that appear. Fort Tarsis in Anthem (2019) is this. One of the Hub Levels of Crash Team Racing is the Trope Namer, and resembles a fortified medieval village. Destiny: The city underneath the Traveler, which has walls and plenty of defenses against encroaching invaders who seek to break in. The Elder Scrolls IV: Oblivion has plenty of walled cities, but the Imperial City has the strongest defences, being the capital city. The Elder Scrolls V: Skyrim also has plenty of walled cities. This is partly because of a shift in world design Bethesda implemented in Oblivion for memory-related issues carried over to Skyrim — major cities are in their own small world-spaces, separate from the larger game-world, which means entering those cities have to be done via a door. This obviously means that the game-designers have to design those cities so that you can only enter and leave them via the door(s), which is most easily done via this trope. Not all the walls are in top condition — Whiterun's outer defenses are crumbling and neglected — but if you get involved in the civil war that's gripped the province, you'll find yourself testing multiple cities' defenses. Most cities in the Exile series had a similar design for similar reasons (though there were plenty of exceptions). In later Avernum games, when engine changes meant there was no longer an overworld/city map divide, this was restricted to only cities of military importance. Insomnia, the capital city of Lucis, in Final Fantasy XV is this. It has a wall, called The Wall powered by magic from the king. The building the king lives in is also called the Citadel. Many minor villages in the Fire Emblem games tend to be walled. If the player finds one in their map, they can send a member of the army to check on it and tell them to close their gates, receiving items as thanks and occasionally recruiting new cast members. In Fire Emblem Fates, both Nohr and Hoshido have citadel cities in their territories. The capital of Nohr, Windmire, is a mix of this and Underground City. Halo: Reach: Reach itself, being the main military stronghold of the UNSC. It's heavily guarded by a fleet of 100-150 warships at any given time, twenty orbital defense platforms (each capable of destroying a Covenant ship with one shot), a nuclear minefield, and enormous quantities of soldiers. Then the Covenant show up with an even larger invasion force. Haven City in the Jak and Daxter series, the last known human holdout on the entire planet during Jak II: Renegade. It's a essentially a self-sufficient fortress, surrounded by thick walls and an eco-powered energy shield that protects the city from the Metal Heads, in addition to constant patrols by the city's defense force, the Krimzon Guard. It's essentially impenetrable, and because crops and livestock are produced inside the walls, it can withstand a siege of any duration (and has, in fact, done so for centuries now). The only weak point is the fact that the city, and by extension the shield wall, is powered by eco, which is obtained from mines outside the city that the Metal Heads actually can attack. A looming eco shortage is a frequent concern raised during the game, as without the shield wall the city stands no chance against the Metal Heads. After Maleficent is slain in Kingdom Hearts I, Hollow Bastion (later regaining its original name Radiant Garden) in Kingdom Hearts II ends up replacing Traverse Town as the recurring hub world in which Sora, Donald and Goofy reconvene with their allies. While not exactly surrounded by literal walls, this world is populated mainly by the Final Fantasy cast and few other refugees who are more than willing to fight any threat that endangers their home and the people living there, Cid and Merlin installing an Anti-Heartless security system as extra security. Unfortunately, because this world contains knowledge collected by Ansem the Wise about the nature of the cosmos, possess enhanced Magitek, is ground-zero for the Heartless threat that kicked off the story and because many of the antagonists possess a personal affinity for the location (most of Organization XIII are from here, Maleficent used it as her main base when she rose to power, etc), this world is constantly a target, most notably with the Battle of 1000 Heartless. The Citadel in Mass Effect is an ancient space station that serves as the galaxy's capital. In addition to an ever-present defense fleet it can close its arms when attacked and render itself inaccessible. And now the subversion: because it's so defensible, the Citadel makes perfect bait for advanced civilizations and allows the Reapers to decapitate the galaxy's leadership in one fell swoop during their 50,000 year harvesting cycle. Every player-built settlement in Rimworld eventually turns into one of these to some extent to defend against the repeated invasions by bandits and Space Pirates. In earlier versions it was possible to exploit the enemy AI by leaving a single gap in the walls and luring them into a huge ambush, but more recent updates have made them aware of the ranges and firing arcs of fixed turrets and added sappers who can tunnel through walls. Savannah Citadel in Sonic Unleashed. There is a huge, thick wall around the place, but the doors in are usually open as the inhabitants are peaceful and friendly to Sonic. Just not Dr. Eggman. In Star Wars: The Old Republic, Kaas City on Dromund Kaas. The houses the Sith Citadel, is surrounded by numerous fortified walls of its own, and has a highly militaristic "peacekeeping" force on the inside. Stellaris lets you go the "planetary citadel" route if you build a lot of Strongholds or Fortresses on your worlds. Indeed, this is a great way to take advantage of a chokepoint in the galaxy's Hyperspace Lanes - the FTL Inhibitors technology means that hostile fleets won't be able to move past a system with at least one active planetary Fortress, so building multiple Fortresses on a planet, combined with a Planetary Shield Generator, means that an invading enemy will have to commit to a long planetary bombardment or grueling invasion to neutralize your fortress world and move deeper into your space. The Stronghold series of games easily lets you build a somewhat realistic version of this. The AI is not so good at doing the same, unless it's the Wolf. Midgard in Tales of Phantasia is an entirely walled city where not only soldiers patrol the walls on the lookout of Dhaos' demon army, there's a fortress with a mana cannon in case of aerial forces. They Are Billions is a Real-Time Strategy game were your goal is to build a Steam Punk version of a Citadel City to defend against massive hordes of the undead. Many Total War games feature walled cities that must be protected from invasion. Games in the series that feature more modern settings (Empire, Napoleon, Shogun 2: Fall of the Samurai) tend to avert this, however, with castles and forts being besieged instead of cities (which are usually seen in the background shots). Most prominently featured in Rome and Medieval games. Successfully attacking walled cities there either required spending a number of turns besieging it (until supplies run out and the defenders give up) or storming it, which usually means the attackers have siege devices such as battering rams, ladders, siege towers, catapults, ballistae, trebuchets, mortars, and/or cannons. In Empire, Napoleon, and Shogun 2, infantry units don't need any such devices and can climb walls on their own. The Human Village in Touhou Project is basically the humans' stronghold in Gensokyo, and houses enough youkai exterminators to make it ill-advised for rogue youkai to even so much as bother any human in the village. And just in case things start going bad, there is a second line of defense in the village's appointed protector, Keine Kamishirasawa, who can outright temporarily hide the entire village's existence (and does so on Imperishable Night). Not to mention Thunder Bluff (built on top of a collection of mesas), Undercity (which looks very strange for a city, but quite natural for an underground fortress), Darnasus (built inside a hollow tree stump larger than most mountains), and The Exodar (a crashed and largely buried spaceship). The climactic raid of Mists of Pandaria was the Siege of Orgrimmar, which was Exactly What It Says on the Tin. In the end, a small strike team (to whit, the players) is put together to systematically weaken the defenses, because otherwise, the attackers have no real chance of success, only a bloody stalemate. The Order of the Stick has Azure City, heavily fortified by an order of paladins and an army of guards. Despite the aid of the Order, the city falls to Xykon and Redcloak's hobgoblin armies. Mechanicsburg in Girl Genius has made repelling invasions into the town sport. In Baskets of Guts Ancard is built on a mountain, and the walls enclose the entire city. It is also a quarter for a large military garrison. Stand Still, Stay Silent: Many of the remaining safe settlements are walled cities due to being surrounded by Plague Zombie territory. In The Gamer's Alliance, several cities are well-fortified to withstand assaults. The most notable ones are Vanna, Maar Sul City and Myridia. In The Solstice War, the eponymous city of Solstice, capital of Ayvarta. It has fifty meter high walls surrounding it on all sides, lies in the middle of a desert, straddling a river. In addition to standard military units, the city has three gigantic cannons known as Prajnas that can level whole streets. World Of Omni: Talmain has high, solid stone walls and only one entrance. There's even two higher tiers (with the imperial palace at the top) with equally sheer sides - and again, only one way to get up each level. The impracticality of this layout, given the considerable jogging distance between each tier threshold, is only acknowledged in passing. Critical Role: Vasselheim, the ancient city of faith, is extremely well fortified. Ba Sing Se from Avatar: The Last Airbender: it actually has two walls, an outer wall to protect the farmland, and an inner wall to protect the city itself. In Bravestarr, Fort Kerium can convert into "fortress mode" when necessary. Autobot City in The Transformers: The Movie transforms into one when the Decepticons launch a surprise attack on it. Unfortunately, due to having the element of surprise the Decepticons successfully trap and/or kill a number of Autobots before the conversion is even complete. The defenses hold long enough for the survivors to receive reinforcements. Most medieval and ancient cities actually did have walls with a limited number of gates, and strict rules against building outside the walls. This served an economic interest: tolls on goods brought into or out of the city was a major revenue stream in medieval times. However, the city guards were more likely to be few in number and often part-timers. And siege preparation in supplies was probably only done when necessary. Most of these cities no longer have such fortifications; although some still do . With the advent of improved gunpowder, new star fort fortifications, designed to limit the power of cannons and the effect of sappers replaced the old style of walled fortification for many cities. Palmanova , a town in Italy, is regarded as one of the first examples of star fort walls being used, and the fortifications still exist there today. Less to limit the power of cannons as to exploit them for defensive purposes, although in a sense it comes to the same thing. The basic idea is to extend structures from the wall that can give each other covering fire and fire upon any advance toward the curtain wall in a diagonal crossfire on the corners of the advancing force(thus confusing the enemy as to where the shot is coming from as well as scoring more One Hit Polykills if the attackers are arrayed in line. And of course simply to get more places to stuff with cannon. Constantinople, the capital of the Eastern Roman Empire. It boasted a triple wall as well as a chain boom that protected its harbor. Many tried and failed to capture the city, even Attila the Hun.note He tried three times before giving up. In a rather amusing note, he had actually gave up after the second, but then he heard the two walls the city had at the time had been destroyed by an earthquake, so he hurried up to attack... And saw that the inhabitants had not only rebuilt the old walls but built a third, at which point he returned home without even trying to attack. Yet, Sultan Mehmet II succeeded with a different approach in 1453... with a powerful cannon designed to destroy said walls in addition to people in the inside who opened a side gate for him. In almost all cases where the cities defenses failed it's major weak point was the cities harbor and the walls facing towards the sea, which were by far the shortest and easily overrun. Cities deep inside the Roman and Chinese empires were often unfortified during the height of their power, it being assumed that The Empire was protecting them so well that the only reason to fortify would be as part of a plan for rebellion. Ancient Sparta was another notable aversion. Sparta had no walls — because any invader had to pass through Spartans first. Japan was another aversion, since foreign invasions were all but unknown. The first Japanese cities, Nara and Kyoto, were modeled on China's walled capital city Chang'an, but their planned outer walls were never built. During the Three Kingdoms era of China (the setting for Romance of the Three Kingdoms), several walled cities saw a lot of action. Hefei, for example, was the site of repeated assaults by Sun Quan, to the point the place became a sort of Eldritch Location for the people of Wu. The old historic city of Seoul was surrounded by castle walls, and four of the main gates were fortified. However these walls didn't protect the city from falling under the battle hardened troops of Japan during the Japanese invasions of Korea through 1592 to 98. The walls failed the Kingdom of Joseon yet again after decades later the Manchu invasions of Korea happened. After these failures, King Jeongjo constructed the Suwon Fortress, a fortified city that used a lot of techniques deemed inovative at that time. The city was never invaded, however. Cities along the Low Countries tended to be some of the most fortified in history as that was one of the nastiest battlegrounds in Europe. Sometimes rather than a city fortifying itself, a city grew up around a fortification that was already there. Soviet and modern era Moscow. It's currently the only city in the world with ground-based anti-missile defence emplacements. note Delhi is supposedly having one installed in the near future. The Moscow Metro is also deep underground enough to provide shelter from a nuke for the citizens, and has a number of government bunkers and installations even deeper underground. Quebec City and Louisburg are two found in North America. Typical European examples of this are often a mixture of styles from several ages. Strategy changes less than tactics (Caesar, Charlemagne, Napoleon, and Guderian had to think about the same rivers and mountains) so fortifications will be in the same place because of the same considerations. For instance many European cities are a jumble of Medieval style (high stone walls) and eighteenth century (lower and thicker with bastions sticking out to hold gun emplacements where they can catch assault troops from the flank making the famous "star" shape). American coastal forts including Fort McHenry of national anthem fame, are "pure" star forts because they were built from scratch rather than being built in the place of a castle or fortified city whose budget did not include tearing down the old walls before replacing them. Because of that American coastal forts are prized by military archeologists. Many cities in England are descended from fortifications made to defend against Vikings. A clue is the name "burg" in a city as "burg" is "Castle" in Anglo-Saxon and several other germanic languages. Carlisle on the Anglo-Scottish border. Yes, it got an awful lot of work. Modern military bases are often cities unto themselves, complete with shopping malls, gas stations, schools, apartment buildings and houses, etc., and miles of fences and walls and barbed wire with armed guards patrolling and controlling access. Due to the highly mobile nature of modern warfare, they rarely resemble the walled fortresses of old, however. Fortress design used to be considered at the top of intellectual discipline. Michelangelo and Leonardo da Vinci were famous in their time for their fortresses, and latter play-fortification was a common hobby of the rich. In Italy and elsewhere there were entire dynasties of fortress designers. During the US Civil War, Washington D.C. was essentially transformed into this as the conflict progressed . Although it was on the border between a loyal border state (Maryland) and a Confederate state (Virginia), the Union capital was essentially protected from both land and sea assaults after the Union Army established a multitude of forts, field artillery, trench networks, and garrisons in and around the city. Barring one exception , it was one of the safest cities and most heavily defended cities that existed during that time. Intramuros, the original colonial capital of the Philippines and modelled largely on the Spanish Empire's other colonial capitals in Latin America, was built towards the end of the 16th century by the Spanish colonizers to defend itself from invasions, though it was heavily damaged during the Battle of Manila during the last months of World War II. The walls and defenses were (partially) repaired in 1951 and lasted through the 80s. Nowadays, the side facing Manila Bay hosts the Manila Cathedral, Palacio del Gobernador (headquarters for the Commission on Elections), and Ayuntamiento de Manila (hosts the treasury bureau), while the one facing the city hall plays host to a number of colleges. In Classical Greece, polises like Corinth and Megara, built huge walls, called "Long Walls" that connected them to other cities. The most famous of these was Athen's, with connected Athens to its PortTowns of Piraeus and Phalerum during the Peloponnesian and Corinthian War to withstand the sieges. During the beginning of the Peloponnesian War, the walls withstood Spartan assault but allowed for a plague one of the trading ships picked up to spread through the city.